L. Rossi Magnetic colloids as building blocks for complex structures: preparation and assembly, in: S. Sacanna and D. Chakrabarti (Ed. ), Colloidal engineering for self-assembly of nano- and micro-structured materials, Elsevier (2018). L. Rossi and S. Sacanna Hematite microswimmers with enhanced photoactivity (2018). 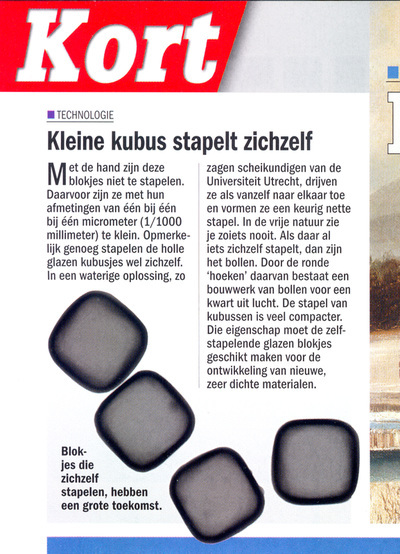 S. I. R. Castillo, P. H. Keijzer, D. M. E. Thies-Weesie, K. P. Velikov, W. K. Kegel, A. P. Philipse and L. Rossi Non-spherical colloidal silica containers for in situ synthesis of functional materials (2018). L. Rossi, J.G. Donaldson, J.-M. Meijer, A.V. Petukhov, D. Kleckner, S.S. Kantorovich, W.T.M. Irvine, A.P. Philipse and S. Sacanna Self-organization in dipolar cube fluids constrained by competing anisotropies, Soft Matter, 14, 1080-1087 (2018). 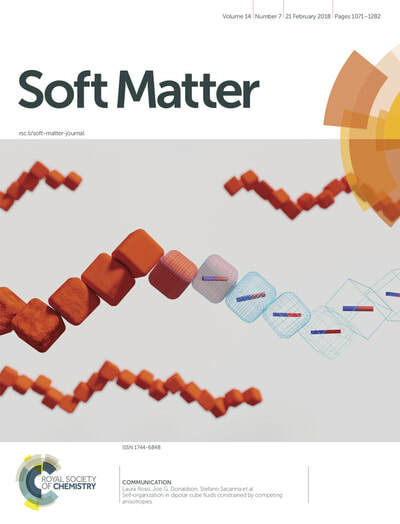 L. Rossi, V. Soni, D. J. Ashton, D. J. Pine, A. P. Philipse, P. M. Chaikin, M. Dijkstra, S. Sacanna and W. T. M. Irvine Shape-sensitive crystallization in colloidal superball fluids, PNAS, 112(17), 5286-5290 (2015). L. Rossi and T. G. Mason Controlling enantiomeric populations in fluctuating Brownian monolayers of chiral colloids, Soft Matter, 11, 2461-2468 (2015). L. Rossi, K. P. Velikov ans A. P. Philipse Colloidal iron(III) pyrophosphate particles, Food Chemistry, 151, 243-247 (2014). J.-M. Meijer, D. V. Byelov, L. Rossi, A. Snigirev, I. Snigireva, A. P. Philipse and A. V. Petukhov Self- assembly of colloidal hematite cubes: a microradian X-ray diffraction exploration of sedimentary crystals, Soft Matter, 9, 10729-10738 (2013). D. V. Byelov, J.-M. Meijer, I. Snigireva, A. Snigirev, L. Rossi, E. van den Pol, A. Kuijk, A. P. Philipse A. Imhof, A. van Blaaderen, G. J. Vroege and A. V. Petukhov In-situ hard x-ray microscopy of self- assembly in colloidal suspensions, RSC Advances, 3, 15670 (2013). J.-M. Meijer, F. Hagemans, L. Rossi, D. V. Byelov, S. I. R. Castillo, A. Snigirev, I. Snigireva, A. P. Philipse and A. V. Petukhov Self-assembly of colloidal cubes via vertical deposition, Langmuir, 28, 7631-7638 (2012). S. Sacanna, L. Rossi and D. J. Pine Magnetic click colloidal assembly, Journal of the American Chemical Society, 134, 6112-6115 (2012). 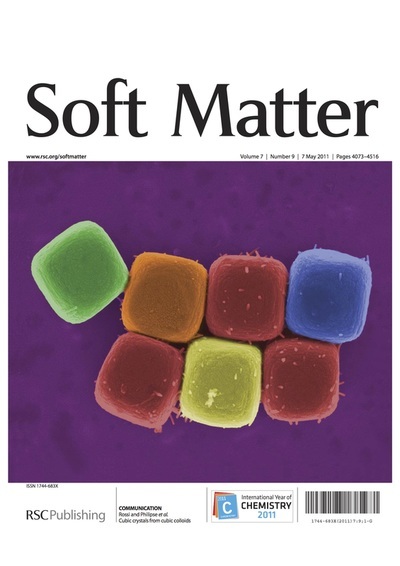 L. Rossi, S. Sacanna, W. T. M. Irvine, P. M. Chaikin, D. J. Pine and A. P. Philipse Cubic crystals from cubic colloids, Soft Matter, 7, 4139-4142 (2011). Work featured on the journal cover. A. V. Kyrylyuk, M. A. van de Haar, L. Rossi, A. Wouterse and A. P. Philipse Isochoric Ideality in Jammed Random Packings of Non-Spherical Granular Matter, Soft Matter, 7, 1671-1674 (2011). 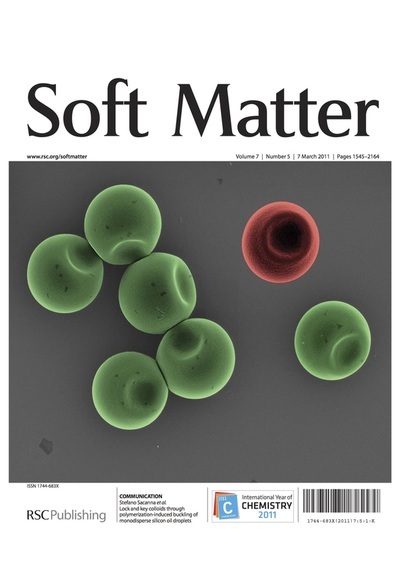 S. Sacanna, W. T. M. Irvine, L. Rossi and D. J. Pine Lock and key colloids through polymerization- induced buckling of monodisperse silicon oil droplets, Soft Matter, 7, 1631-1634 (2011). L. Rossi, S. Sacanna and K. P. Velikov Cholesteric colloidal liquid crystals from phytosterol rod-like particles, Soft Matter, 7, 64-67 (2011). L. Rossi, J. W. M. Seijen ten Hoorn, S. M. Melnikov and K. P. Velikov Colloidal phytosterols: synthesis, characterization and bioaccessibility, Soft Matter, 6, 928-936 (2010). S. Sacanna, L. Rossi and A.P. Philipse Oil-in-water emulsification induced by ellipsoidal hematite colloids: evidence for hydrolysis-mediated self-assembly, Langmuir, 23(20), 9974-9982 (2007). S. Sacanna, L. Rossi, A.Wouterse and A.P. Philipse Observation of a shape-dependent density max- imum in random packings and glasses of colloidal silica ellipsoids, Journal of Physics: Condensed Matter, 19(37), 376108-376124 (2007). S. Sacanna, L. Rossi, B.W.M. Kuipers and A.P. Philipse Fluorescent monodisperse silica ellipsoids for rotational diffusion studies, Langmuir, 22(4), 1822-1827 (2006).